Markets fell across the globe in early trading Monday amid the fallout from U.S. data and economic concerns in places such as China and Italy. The U.S. bond market is closed today for the Columbus Day holiday. The U.S. bond market is closed for the Columbus Day holiday. Shanghai market falls after China lowers reserve requirement for banks. Some banks report earnings later this week. 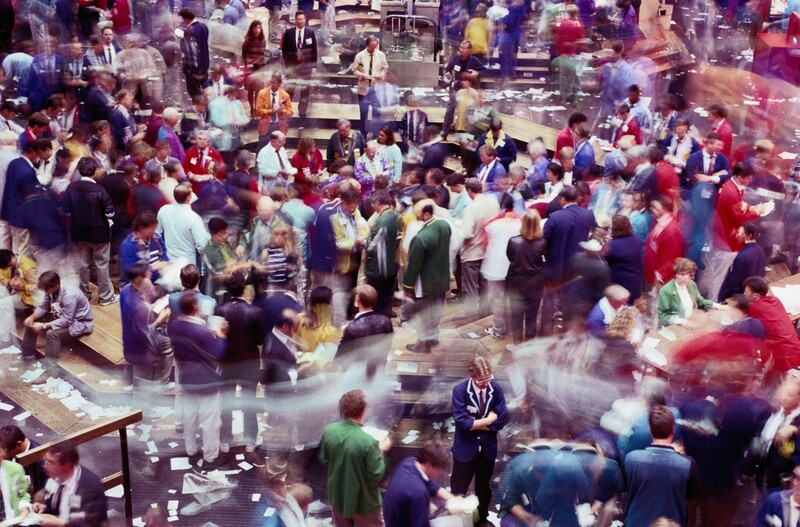 (Monday Market Open) As the economy chugs along, investors have been eying inflation, and it seems those concerns have ratcheted up as government debt yields rise. Looking forward this week, the market is scheduled to get a couple of key reports on inflation and many investors will likely be weighing what they could mean for future interest rate hikes, and perhaps companies in the financial sector, some of which will report earnings on Friday. Last week, strong economic data and expectations of continued rate hikes by the Fed appeared to lead some investors to take money out of cautionary U.S. Treasurys. Because bond prices move inversely to yields, the selloff pushed Treasury yields higher, and the closely watched 10-year yield moved to a multi-year high above 3.2%. Today is the Columbus Day holiday in the U.S, and the bond market is closed, giving equity investors a break from yield movements. But there was still pressure on Wall Street, based on equity index futures, following a selloff in Asian shares led by the Shanghai market. China lowered the amount of cash banks must keep on hand. The move apparently is meant to help stimulate the Chinese economy and comes at a time of high trade tensions between the world’s two largest economies that some investors have worried could dent global economic growth. The move appeared to weaken China’s currency, and the yuan was down compared to the dollar on Monday morning to about 6.93 versus the dollar. In other news from overseas, European markets were also lower. Worries over Italy’s budget appeared to be the main culprit for the negative sentiment. It could be interesting to see what producer and consumer price data later this week says about inflation. If the numbers point to higher inflation, that could arguably help continue to support yields by reinforcing the view that the Fed is likely to continue hiking rates. Higher inflation also suggests a strong economy, which means investors may not have as much desire for more defensive investments like government debt. So, if investors are feeling less defensive, why have stocks reacted negatively to rising rates? First of all, just because money comes out of fixed income doesn’t mean it’s necessarily being plowed right back into equites. Also, rising interest rates can make it more expensive for corporations to borrow money to finance operations, expansions or acquisitions. Some investors may also worry that the Fed could raise rates more quickly than is comfortable for the stock market. Still, the stock market has been doing well despite the interest rate hikes we’ve already been seeing from the Fed and the expectations that the central bank will continue to raise rates. So, it’s possible that the worry among some equity investors about higher rates could ease, especially if they focus on the solid economic fundamentals that seem to be behind the higher yields. One sector that tends to do well in a rising rate environment is the banks; higher interest rates may widen their net interest margin (NIM) — the difference between the interest on loans they make versus that which they pay on deposits. We’ll see some bank earnings later in the week. JP Morgan (JPM), Wells Fargo (WFC), Citigroup (C), and PNC Financial (PNC) all report before market open on Friday. While the results won’t reflect this latest surge in Treasury yields, it might be interesting to see if company executives talk about higher yields going forward. FIGURE 1: CRUDE FOLLOWED YIELDS HIGHER. 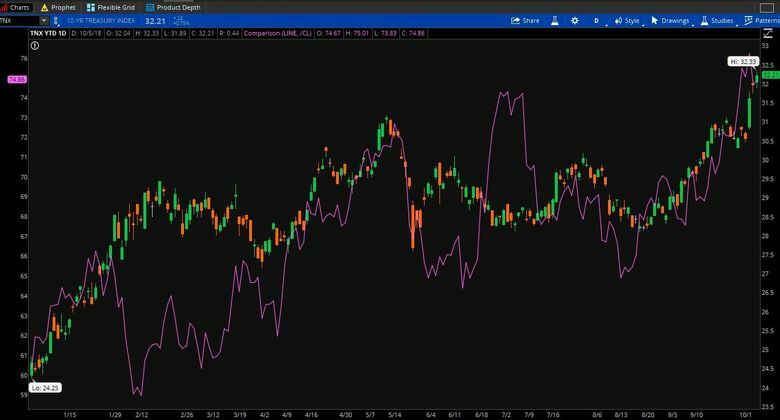 This chart shows that the 10-year Treasury note yield and U.S. crude price (purple line) have become closely linked, especially over the last few months. Crude seems to be following yields up, perhaps as some investors look to crude as a way to hedge potential inflation. Data source: CME Group. Chart source: The thinkorswim® platform from TD Ameritrade. For illustrative purposes only. Past performance does not guarantee future results. Storm Damage: You could be forgiven if you’re scratching your head after last week’s September private-sector payroll report from Automatic Data Processing (ADP) and Moody’s Analytics came in much stronger than expected but the the government’s report on Friday fell short. Both had been expected to show job growth of 184,000, according to a consensus of economists provided by Briefing.com. But the ADP report showed that 230,000 non-government jobs were created while the government figure showed that 134,000 non-farm jobs were created. Although it wouldn’t account for the whole difference, because of ADP’s methodology its report didn’t account for people displaced by Hurricane Florence. Mark Zandi, chief economist with Moody’s Analytics, told CNBC that the storm impact could reduce the actual count by 25,000. Meanwhile, there is the possibility that the storm might have weighed on Friday’s non-farm payrolls report. Steeper Climb: If there’s one positive for stocks coming out of the jump in bond yields last week, it might be a widening gap between 2-year and 10-year Treasury yields. That gap, which had fallen to near 20 basis points at times earlier this year from above 70 basis points in 2017 and stood near 25 basis points only a week or so ago, widened to just over 32 basis points Friday as longer-term fixed income securities took a bigger hit than short-term ones. Even at 32 basis points, the yield curve still looks pretty flat by historic standards, but it could be worth watching to see if it continues this minor change in direction over coming weeks, because that could potentially lift some concerns about the economy associated with the possibility of an inverted curve. In the past, inverted curves have often been associated with recessions, though cause and effect remain a matter of debate. Looking to Inflation Data: This week is relatively light on economic data reports. But there are two reports that might stand out in importance and are likely to be closely watched. 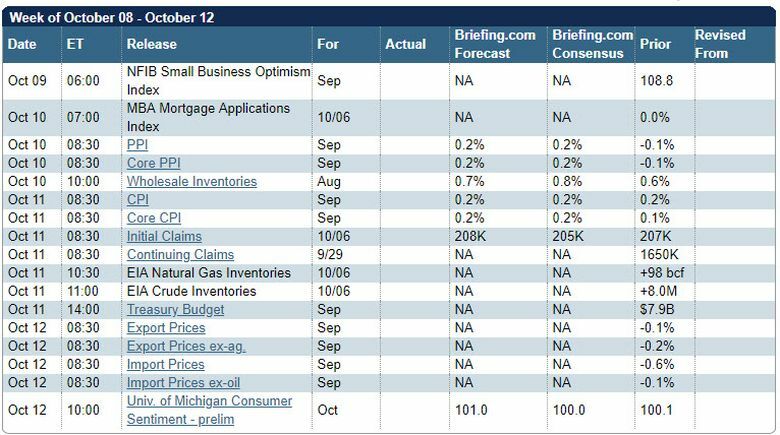 On Wednesday we’ll get September producer price data, and the next day we’ll see a report on consumer prices for last month. If you’ll recall, headline producer prices fell by 0.1% in August while top line consumer prices rose by 0.2%. With the solid numbers we’ve been seeing for the U.S. economy and what that could mean for demand for things like commodities, one has to wonder whether we’ll see higher prices paid by producers for the inputs they use to make things. If that happens, look out for potentially higher prices trickling through to consumers. Although inflation like this has been relatively tame of late, if the economy remains as strong as it has been, inflation could accelerate. That could stoke investor worries about the Fed tightening rates too quickly for the stock market’s taste even if the central bank is acting to keep the strong economy from overheating. Looking to stay on top of the markets? Check out the TD Ameritrade Network, which is live programming that brings you market news and helps you hone your trading knowledge. Plus, there’s a new playlist on the TD Ameritrade YouTube Channel: Introduction to Volatility, featuring recent content from the TD Ameritrade Network.